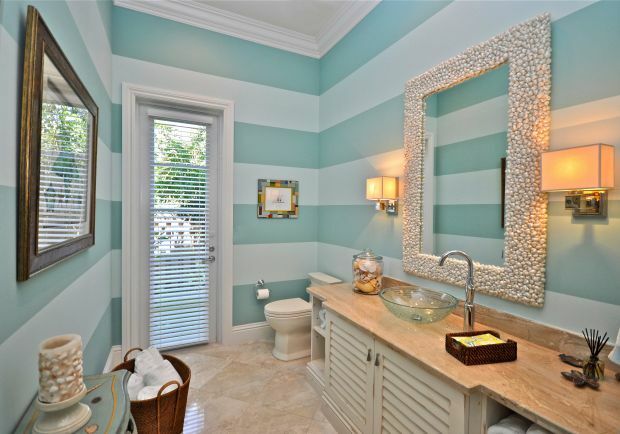 When it comes to decorating your beach bathroom, there really is no shortage of ideas! I personally think that simplicity is best – so its a matter of getting your color choices right, and then add a few – but stunning – accessories. 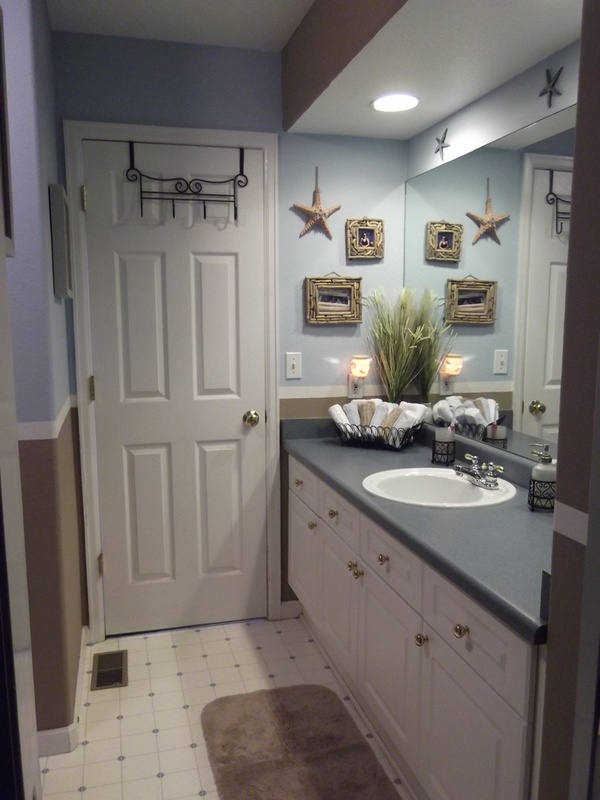 Here are some beach bathroom ideas for inspiration! The main ideas to take away from here are the sisal bath rug, woven wicker/reed basket, the stripey towels (always a great look for the beach theme! 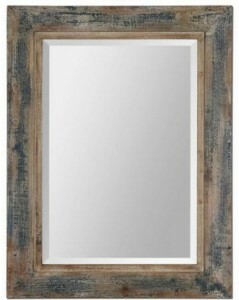 ), the mirror hanging on a nautical rope and the wooden “beach” sign above the door. 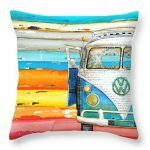 The colors also tie in with the theme. 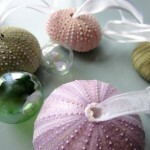 A great idea are also the off-white distressed frames with cloth as a background and some shells or sea stars glued on. 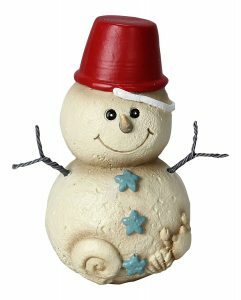 So simple, yet so effective and beautiful! 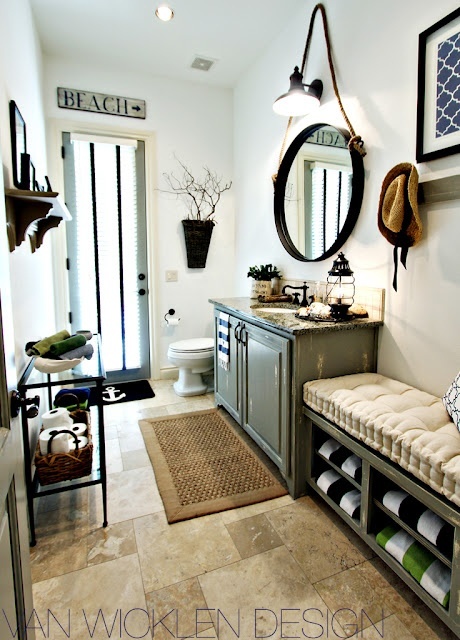 Rolled up towels in coastal colors placed in a basket also always add to the charm of a beach themed bathroom. You could also stack your toilet paper in baskets, like shown in the first picture. 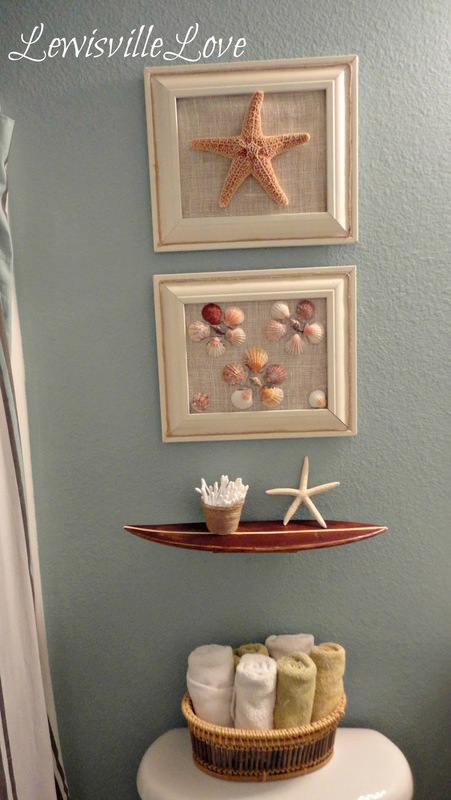 The following bathroom uses the beach and coastal colors (light blue, sandy brown, white) to set the background for a few accessories like the beautiful driftwood picture frames and the life like sea stars. Now, I personally absolutely love the next one down below, even though if anybody would tell me to paint the walls of any of my rooms in stripes I would think they are mad! But I think you agree with me that in this case it just all comes together really nicely, and it is not over the top as you would assume, but rather still very sophisticated and calm looking. one thing I forgot to mention earlier – some kind of beach grass or tropical plant (either real or artificial) will also enhance the beach feel greatly. Some other beach bathroom ideas would be glass fishing floats, metal fish wall decor and sinks shaped like waves.